Tell has been awarded first prize at the "1st International Competition for Herpetological Scientific Illustration 2014", X111 Iberian Congress of Herpetology, University of Aveiro, Portugal. The John Foden Memorial Lecture took pla﻿﻿ce at Drayton Manor Park & Zoo, Staffordshire, UK in August 2013. Tell was the guest spe﻿﻿aker a﻿﻿t this event and presented an illustrated talk about his Herping Trip to the Amazon. Grey-banded Kingsnakes, another t-shirt design for Eco (also used for an IHS symposium). Compared with many of my other images, this t-shirt is quite simple and appears more graphic in design. While working on this I was reminded of the times spent herping in west Texas, searching the rock-cuts for a glimpse of one of these gorgeous but elusive snakes. In April we set out for the mountains and desert area along the border of Arizona and Mexico, in search of the elusive and beautiful white phase of the Speckled Rattlesnake. Access to this remote and dangerous area is restricted, and special permits were required from the Gila Bend Airforce Base. Wonderful scenery, and great company proved the perfect way to celebrate my birthday. 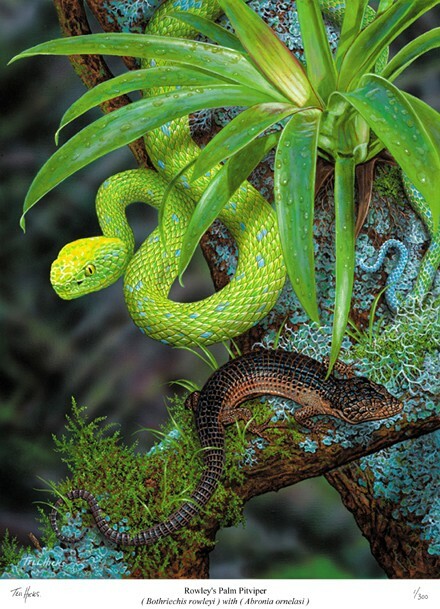 I recently produced several new limited edition prints, including this one of the stunning Rowley’s Palm Pitviper (Bothriechis rowleyi). Inhabitants of the cloud forests of SW Mexico, only a few of these fantastic snakes have ever been found. Fortunately they have been successfully bred in captivity and can now be seen in several zoos. Although not the prettiest of the arboreal Alligator Lizards, the equally rare Abronia ornelasi shares the snake’s restricted range and was an obvious choice to include in this composition.